and a desire to play in the dirt. One day, after moaning and groaning about the stress of my job, the question was asked, "If you could do anything in your life, what would you want to do?" "Start an herb farm" was the first thing that popped in my head. And thus concept of The Happy Hoe Herb Farm was born! I have always been a gardener and home herbalist, mixing up potions and lotions. In tough times, it was cheaper to make homemade salves and such than it was to buy something at the store. But can one make a living doing that? We are still in the neophyte stage, a seedling waiting to be planted. The actual farm will be located in Darrington, Washington - a small mountain town northeast of the Seattle/Everett area (population 1500 or less). Why Darrington? Well, that's where my beau lives and we combined our households in September of 2009 after his last tour in Iraq. As you can imagine, there's not much work to be found in a little old logging town. Sure, I could drive an hour to a bigger city where I could easily find work, but if you've ever been to the Seattle area, you know what a freak'n nightmare that is! So what's a girl to do? Why start a business, of course! I've always longed to own my own business and now that I'm in my mid-forties, I'm finding it more difficult to deal with a boss and the rigors of a regular 9-5 job. Perhaps it's a midlife crisis, but I have been presented with a wonderful opportunity to change my course in the pursuit of wealth and happiness. He has 2 acres for me to work with and I have a one year sabbatical from work to pursue this dream so I'm going for it. Nothing ventured...nothing gained and I'm always up for a new adventure. At this time, I'm simply prepping the soil of the business...writing a business plan, getting a license, creating a website, designing a logo, deciding what to grow and what items to sell. But check back often to see how this seedling comes into full bloom! This is the first plot of the farm otherwise known as my garden. The future site of the Happy Hoe Herb Farm is still raw land that needs to be tilled and planted. The goal is to have that taken care of in Spring of 2011. I was aiming for this year, but that didn't happen so we have a new goal. Until then, I'll just grow where I can, gather seed, eat peas, and hoe weeds. -Good Things Come in Small Packages! This is the future site of The Happy Hoe Herb Farm. As you can see, there is a lot of work to be done. Plus because of the creek being salmon habitat, there are most likely regulations to take into consideration. Oh, and on an updated afternote, it might have been a good thing to make sure you actually own the property and have water rights to the creek. That issue did arise and I'm not sure if it ever was resolved. This is the hoe's temporary home...a sweet little cabin tucked in a lakeside community...on a street called Beaver Place no less! How funny is that!?! Fat Mao Kitty is enjoying it. It's not a bad place to be while we look for a place to buy. February 2012 - I'M BACK!! And bringing a new line of seeds to naughty up your garden! New look, new stuff for sale, and hopefully a new home for The Happy Hoe Herb Farm! July 2010 - FIND US ON FACEBOOK! The Hoe has her own facebook page. Now she just needs some friends! C'mon...you know I'm your favorite Hoe! June 2010 - T-SHIRTS NOW AVAILABLE! Please go to our homepage and follow the link. February 2010 - WE ARE LIVE! After owning my domain names for close to a year, I have finally figured out how to link them to the website. 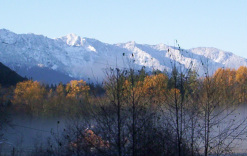 September 2009 - I have moved to Darrington. And so it begins. See our new "And Away We Hoe" page for more detail on our business progression. May 2009 - It's Official! May Day and I just got my business license in the mail...woohoo...The Happy Hoe is legit! A feeble attempt to adapt a caricature of me. Originally I had a chicken in my hand. You've come a long way baby!